The dough should be prepared about 2 hours ahead of preparing the poli. In a bowl, add salt, turmeric and 1 tbsp of ghee to the maida and prepare a soft dough with enough water. Add the rest of the ghee/oil and let the dough rest for 2 hours. It is important to add ghee or oil after preparing the maida to make the dough pliable. Pressure cook the channa dal for 2-3 whistles with very little water. The dal should not become very mushy. The texture of the dal should be maintained at the same time the dal should be cooked. Once the pressure drops, spread the cooked dal over a clean cloth allowing the moisture to completely evaporate. In a blender, blend the dal without adding water. The texture should be like powder. Keep this aside in a bowl. Heat a kadai and add the dal, jaggery and mix well. Keep the flame on sim-medium. Keep stirring till the jaggery melts and the mixture forms a dough. Add the coconut and elaichi powder and stir. Keep stirring until it forms a good dough like consistency. 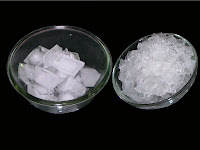 Once combined, remove to a bowl and cool. 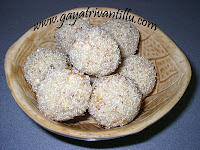 Take lemon sized ball of the maida dough and spread on a greased plastic sheet / banana leaf. Grease your hand with oil and spread the dough with your hand on the sheet. Keep the purnam ball in it. Seal it by bringing the corners of the chapathi to the center. Grease the dough with oil and spread the dough like paratha. Make it as thin as possible without letting the purnam to come out of the maida. Make the rest of the polis in the similar way. Polis taste best when done with ghee. So heat a pan and grease with ghee. Place the prepared poli on it and roast on both sides by smearing ghee. Once done from both sides remove to a plate. Tasty tasty polis are ready to be served. You can add a little ghee while serving to make it tastier. 1. Do not add water while grinding the channa dal. This can reduce the shelf life of the polis. 2. If you are sweet toothed, you can add 1/2 cup more jaggery. Also, the measurement depends on how sweet the jaggery is. Sometimes the jaggery is more sweeter in which case 1 cup should be more than enough. 3. You could also make the purnam, by first putting the jaggery in kadai, melting it and then adding the ground channa dal. Namaste. I'm Pavitra from Hyderabad(ram nagar). I am a huge huge fan of yours. Have tried a lot of recipes from your website (mostly chutneys/pickles) and they have come out awesome. Feels very good to see recipe videos in telugu. Congrats on reaching 300 videos. I've just visited the wish-list section. I've posted recipe for Bobbatlu. I'm attaching the final picture. Please do not even think of retiring. We want to see those wonderful recipes both traditional and modern coming in from you. Keep up the good work. 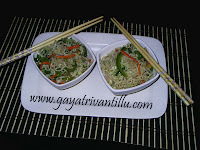 Please visit my food blog http://whatscookin2day.blogspot.in/. Would love to hear from you.